Being located in the North-East of Scotland, people often think that rain, wind and snow would summarise the weather we have but you couldn’t be more wrong. The photo, from the Met Office, above speaks for itself. Yes we do get rain now and again and although areas close by can have 10-15 inches of snow you would be surprised that by driving 5 miles down the road you would be lucky to find an inch. People often think I am talking rubbish and indeed have been proved wrong on one occasion but the winters of 2009/10 were a bad experience for the whole country as well as the Moray area. Quite often on the weather forecasts you don’t see the little area of Moray avoiding most of the weather fronts and in the 8 years we have lived here we have often been asked if we are ok, but we will be because we live in a micro-climate. We were indeed told about the Moray climate when we were thinking of moving up here, one person told us that they had actually had a BBQ when visiting friends over the New Year period. The UK as a whole has just experienced one of the wettest and stormiest winters on record, which very sadly has affected many people’s homes and businesses and hope that they will get all the help they need to overcome this. 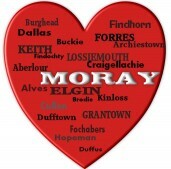 I feel very fortunate to have chosen to live and settle in Moray, the weather is just one of the many positives of the area, why not come and visit to find out the rest! !